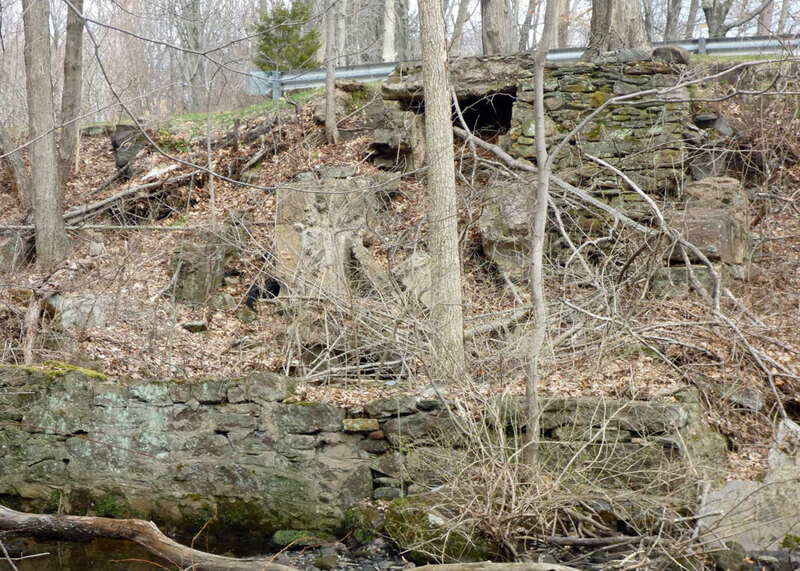 Phoenixville is one of the small, largely forgotten, mill villages in Vernon. Indeed the only reference to the village name and most of its history is found in "Cascades and Courage," George S. Brookes' 1955 history of Vernon and Rockville. The village includes parts of Phoenix Street and Maple Street. The primary features visible today are the Tankerhoosen Lake, dam and the mill pond. Once this quiet corner was a busy village. STEPHEN FULLER, discovering a beaver dam here on the Tankerhoosen, was the first to make use of the river's waterpower. In 1808, the year Vernon incorporated, COLONEL FRANCIS MCLEAN purchased this site from Fuller to build a sawmill. He later included a gristmill and an oil mill, moving one of the buildings from the Valley Falls area. The dam dates to 1830 and there seem to have been mills on both sides of the river. McLean sold the mills to WILLIAM BAKER and HARVEY W. MINER, and in 1836 they sold to a company known as the Phoenix Mills Company, who built the largest of the buildings about 1836 manufacturing cotton warp. One of the company directors was LEBBEUS BISSEL, whose family would later own the land that would become the Tankerhoosen Wildlife Management Area. 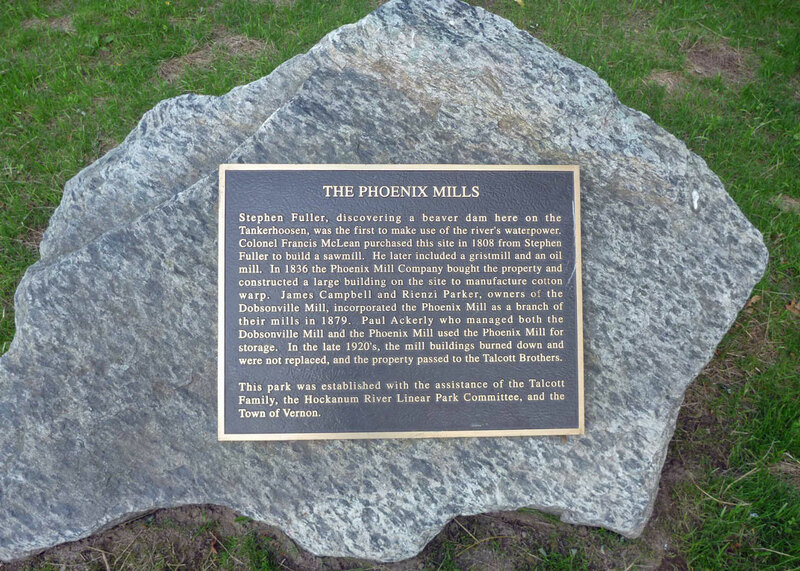 JAMES CAMPBELL (Campbell Avenue) and RIENZI PARKER, owners of the Dobsonville Mill, incorporated the Phoenix Mill as a branch of the Ravine Mills Company in 1879 and produced seine twine in the mill. PAUL ACKERLY, who later managed both the Dobsonville Mill and the Phoenix Mill, used the Phoenix Mill for storage. The 1921 Sanford diagram notes this location is outside the corporate limits suggesting that the property was sold. In July, 1926 the TALCOTT BROTHERS COMPANY bought the Phoenix Mill, Vernon Woolen Mill and the Ravine Mill from Ackerly. In the late 1920's, the mill buildings burned down and were not replaced. Remains of the walls are visible if you peer over the bank. The 1883 "Historical and Industrial Review" provides the following description: The dimensions of the mill are 110 x 35 feet, three stories and attic, and two L's, 50 x 40 and 80 x 20 respectively, each two stories. The basement of the whole is of stone, the upper stories being of wood; and 25 people are employed. The fall of water at this power is 18 feet. A Risdon turbine wheel is used, supplemented by a forty-horse power engine. The only sketch of the Phoenix Mill is on an inset in the O. H. Bailey & Co. 1895 Rockville Map. It shows a typical 3-story brick factory with a bell tower. Factory bells were an essential part of every village as they regulated the day calling employees to work. This bell was made by Doolittle, a Hartford company, upon which was inscribed the date, 1840. In 1922 Paul Ackerley built the Lucinda Chapel at Grove Hill Cemetery in Rockville in memory of his mother-in-law Mrs. E. Stevens Henry. The Phoenix Mill bell now hangs in that chapel. 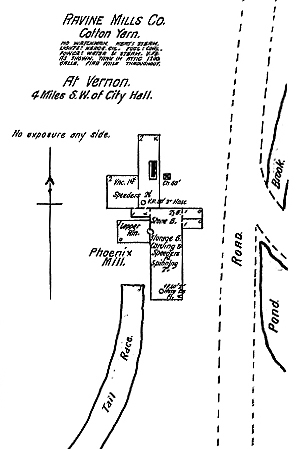 A layout of the mill is included in the Sanborn insurance maps of 1897, 1903, 1911 and 1921. At that time the company was the Ravine Mills Company and the Phoenix Mill produced cotton yarn. The layout shows a number of wings. The 1897 drawing notes speeders, a lapper room, carding and spinning rooms. The top note says: "No watchman. Heat: Steam. Lights: Kerosene oil. Fuel: Coal. Power: Water and steam. V.P's as shown. Tank in attic 1200 gallons. Fire pails throughout." The 1903 and 1911 drawings are similar but add location of loading and storage sheds and that there are two floors for production. In 1921 it notes that the building was used only for storage and is called the Paul Ackerly Upper Mill. Both the 1911 and 1921 refer to it as a Paul Ackerly Mill. 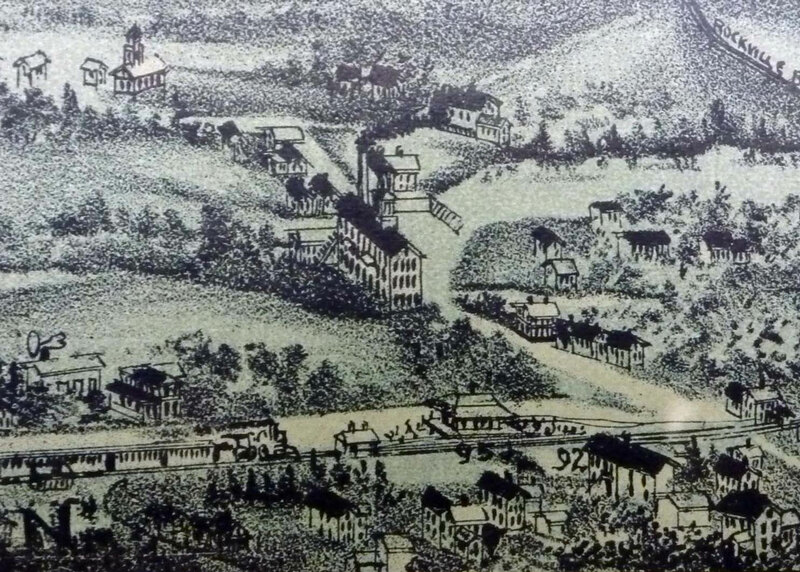 When Phoenixville was a thriving village Phoenix Street connected the railroad at Vernon Depot with Hartford Turnpike just opposite the present Vernon Diner. Until recently the right-of-way was visible from Route 30, but has been lost to the Dunkin Donuts Plaza. Campbell Avenue was a dirt road used by workers traveling to the Dobsonville Mill. Villages of the time were self contained with worker and supervisor housing provided by the company. There are still several houses dating to that period on Phoenix and Maple Streets. The South School District's schoolhouse was up the hill on Phoenix at the junction with Church Street. 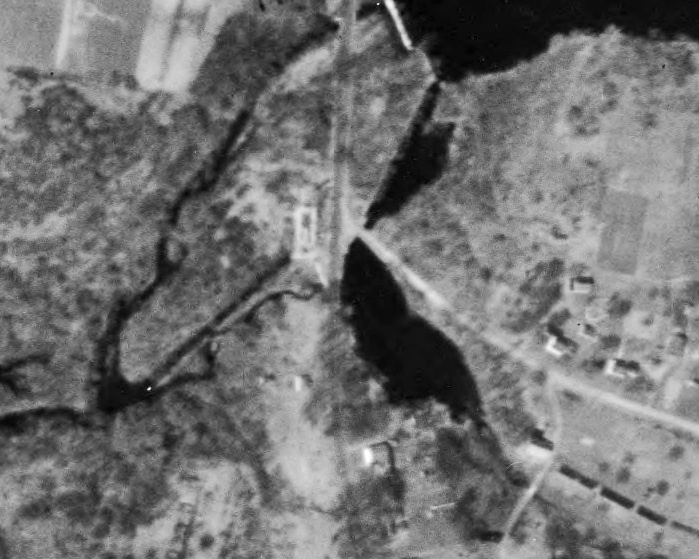 A 1934 aerial photo provides one of the best glimpses of what the area once looked like. Although the mill is gone the foundation at the intersection of Maple Street is clearly visible giving an approximation of the mill's size. Also visible is the channel that carried water from the lake to the mill by way of a small pond where the town parking lot is now located. 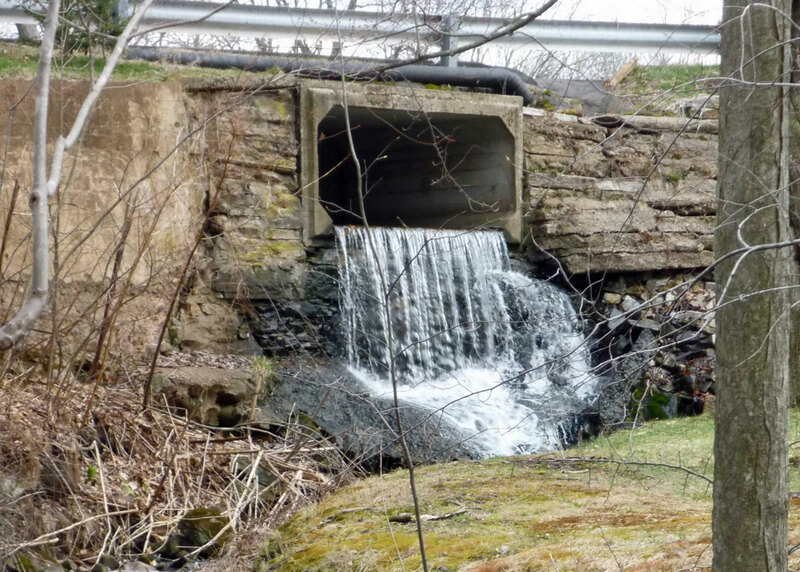 It flowed under Maple Street and into the Ackerly Pond before dropping into the mill over a second dam. This channel is clearly shown in photos and maps up into the 1950's. There would have been a sluice or gate at the dam to control the water flow. 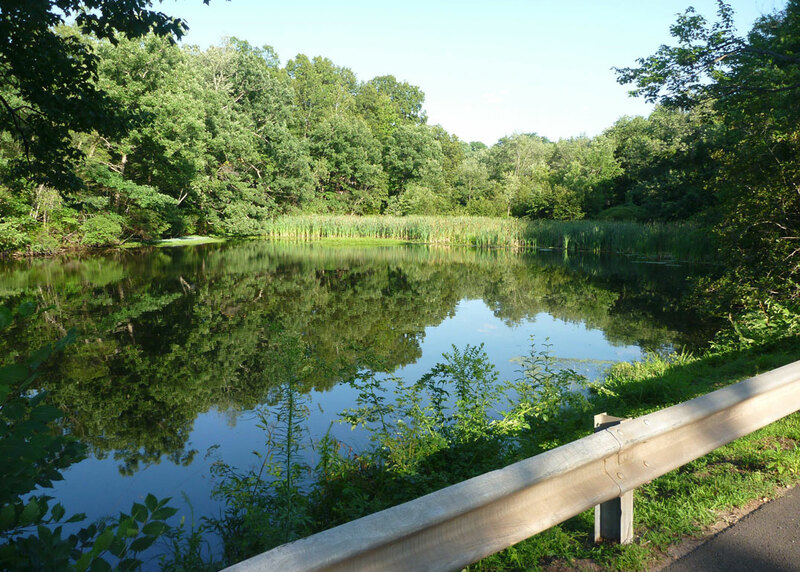 Ackerly Pond is fed by Tillinghast Brook and was created for the mill. It is rapidly filling with sediment getting smaller each year. Still popular with wildlife you may see ducks, geese, beaver or blue herons in the water. Several 2-family worker houses remain. 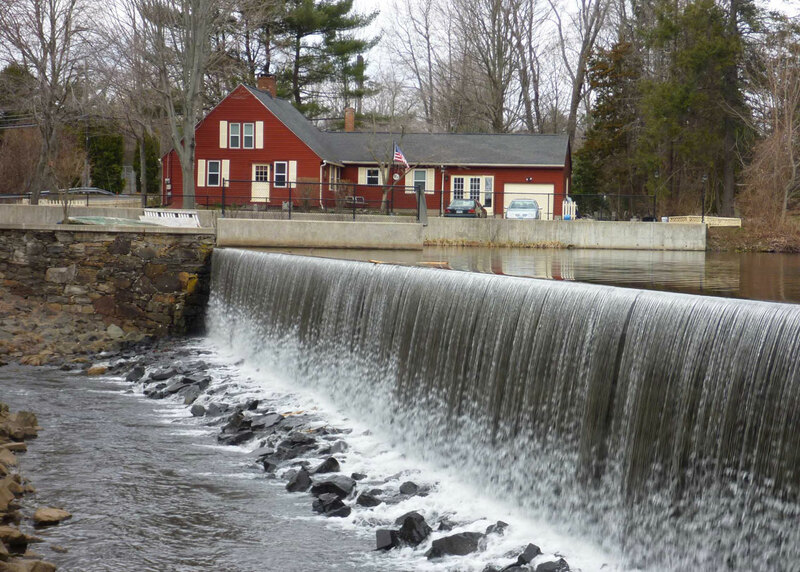 Spillway from the Mill Pond to the mill. Remains of the basement walls. The primary feature of the area today is the Tankerhoosen Lake dam, the only dam in the Tankerhoosen Valley visible from the street and arguably the most scenic. For those who like statistics Tankerhoosen Lake is the largest in the Tankerhoosen Valley with a normal surface area of 16.5 acres, draining an area of nearly 11 square miles and is owned by the DEEP. The dam is masonry, of earthen construction with a height is 16 feet and a length of 237 feet. Near the dam and lake is a small park owned by the town of Vernon. Below the dam the park contains an historical marker with the area's history. Above the dam and next to the lake are benches. It's a good place to teach children how to fish. In recent news the circa 1940 bridge over the Tankerhoosen River was replaced at a cost of $1.1 million with a new bridge opening in July 2012. 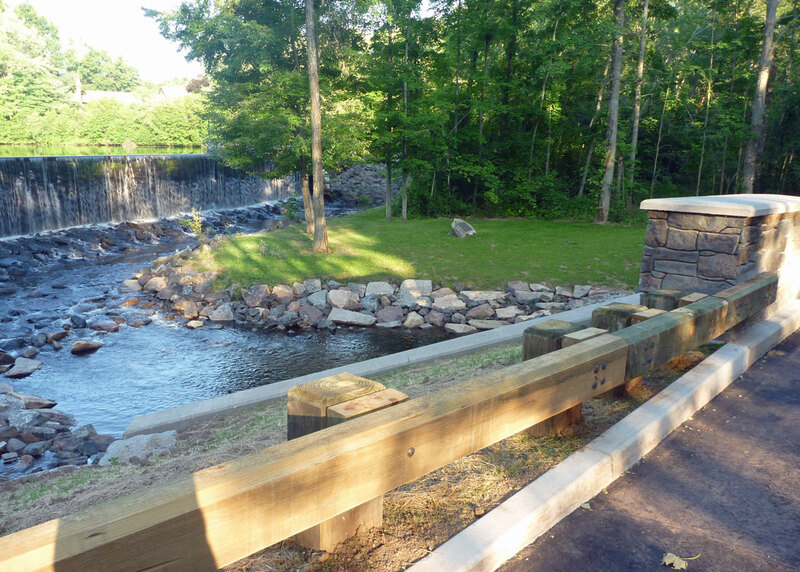 The stone design of the new bridge nicely complements the area. The mill pond still exists and is today part marsh, frequented by ducks, geese and an occasional egret. The channel from lake to pond is now a parking lot. West of Phoenix Street and down the bank are remains of the mill including old walls and water channels. 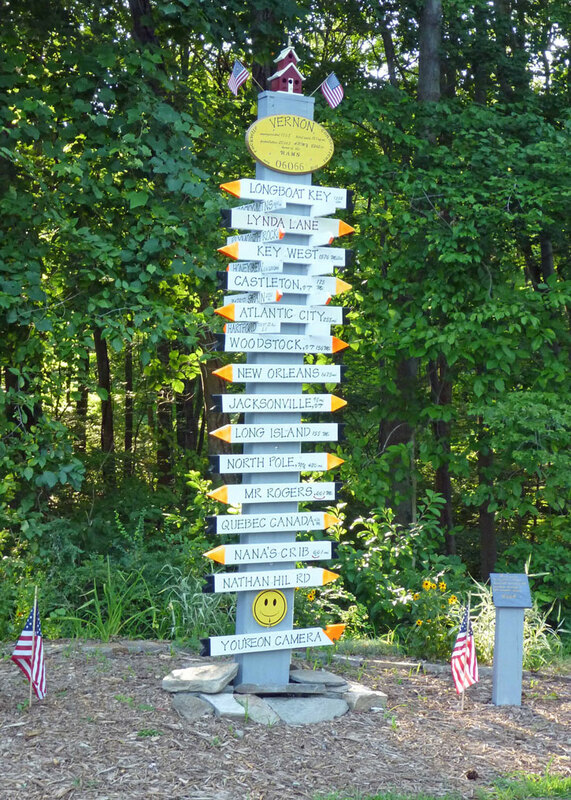 Nearby is another unique feature - a homemade direction sign and fancy birdhouses built by neighbors Bill and Dave. The current residents of what was once Phoenixville take pride in the area helping to maintain the park and beauty of the area. 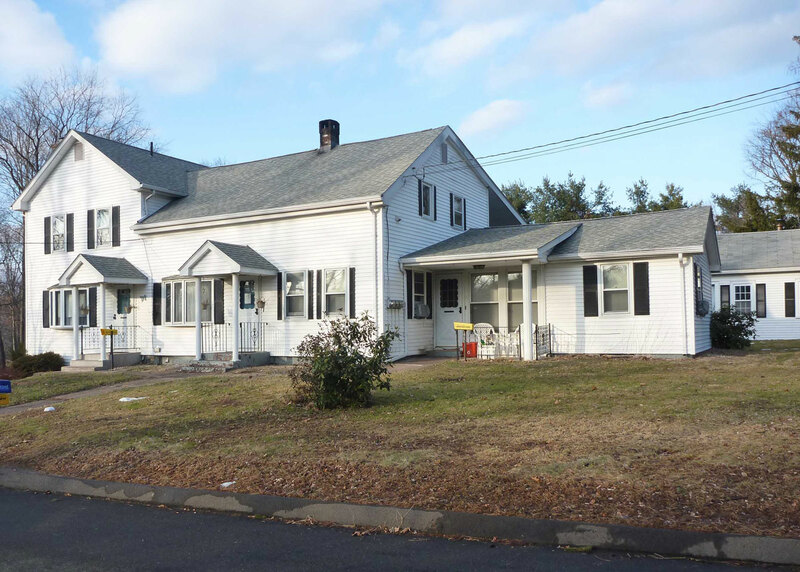 "Mr Houle and family have moved from Andover into one of the Ackerly tenements in Phoenixville. Mr. Houle has entered the employ of Paul Ackerly." "Paul Ackerly's auto truck, which was badly damaged by accidentally catching fire last fall, has been completely rebuilt and is in commission again." "Joseph McCrystal, who had his left hand caught in the gears while attempting to open the water gate at the Phoenix Mill pond last Thursday evening, had to have one joint of one finger amputated. Two other fingers were badly lacerated and bruised." Scott Lent's Vernon Depot, Dobsonville and Mills website. (1883). The Historical Statistical and Industrial Review of the State of Connecticut, Part I. W. S. Webb & Co. Detail review of businesses including mills. The link is just to the Vernon and Rockville section. Page 264 has a description of the Phoenix mill. FindLakes.com - Information on CT lakes. Ackerly Pond. New bridge overlooking park. Historic Plaque.